Image credit: Ecoviva video screen capture. In many tropical areas, dense mangrove forests line the shore. The trees’ tangled, exposed roots withstand the ebb and flow of daily tides. 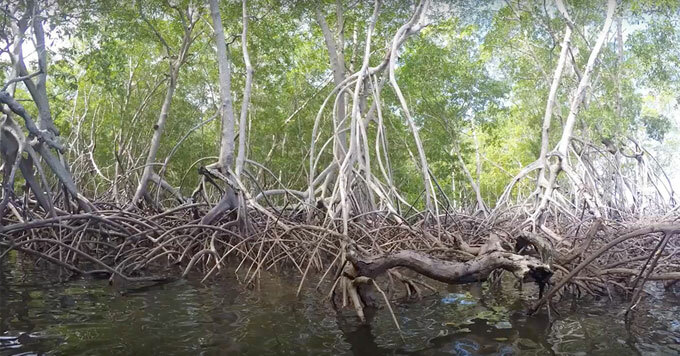 By slowing the movement of water and trapping sediment, mangroves help stabilize coastlines and reduce the impacts of storm waves and flooding – growing threats as the climate changes. These distinctive trees also help reduce global warming because their rich, waterlogged soil can absorb and store a great deal of carbon. But many mangrove forests are disappearing. That’s Karolo Aparicio of the nonprofit Ecoviva. The group is part of a coalition working to restore mangrove forests in El Salvador. Still, about a third of the world’s mangroves have been destroyed over the past 50 years, so advocates say there’s a lot more to be done to protect and restore mangroves around the world.